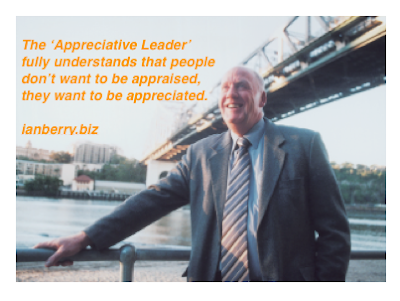 Showing appreciation is simple to do. And it’s so powerful it’s actually the cornerstone of my life and work. However, just because it’s simple, it isn’t always easy to do it in practice. Here’s a quick way to help make it work. My friend Nigel Risner provides us with a big clue when he says IF YOU'RE IN THE ROOM, BE IN THE ROOM. Yet situations can throw us off course from this wonderful advice and take us away from our internal core appreciation of ourselves which enables us to be in the room in the first place. Below is part of a conversation I had recently with a client who had temporarily lost her bearings regarding her core appreciation of herself, after a heated discussion with her boss. “What little things could you do to surprise and delight your boss? I asked. Reflect on the people closest to you at home, at work, and the other places you go. Write down these people’s names and one way you could show genuine appreciation to them in the next fortnight without any cost except that of your time and energy. Go show appreciation without attachment to getting back. Make this ritual part of your everyday life. And if you need any simple, practical help with this, do give me a shout. PS The above is the first in a seven part series of suggestions in my Monday Morning Momentum offerings for both working on yourself (as above) and working on your business. You'll find the video and the working on your business suggestion here.